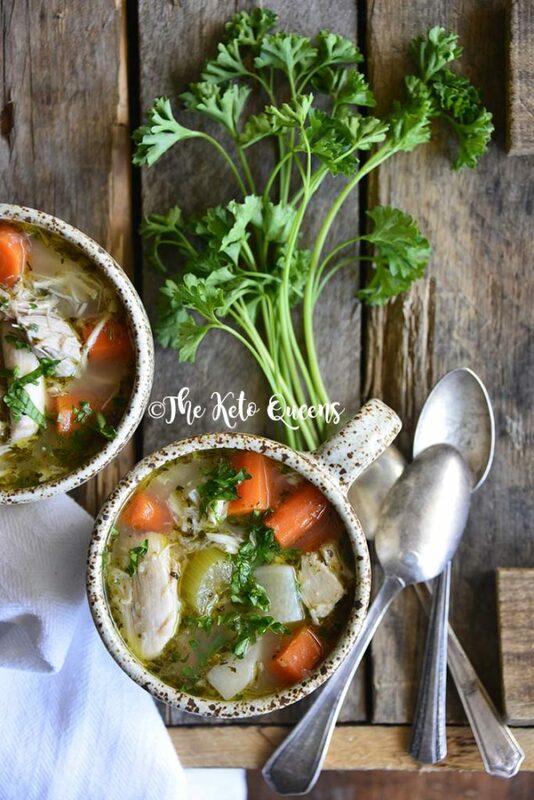 The Best Leftover Chicken Bone Broth Soup Recipe! 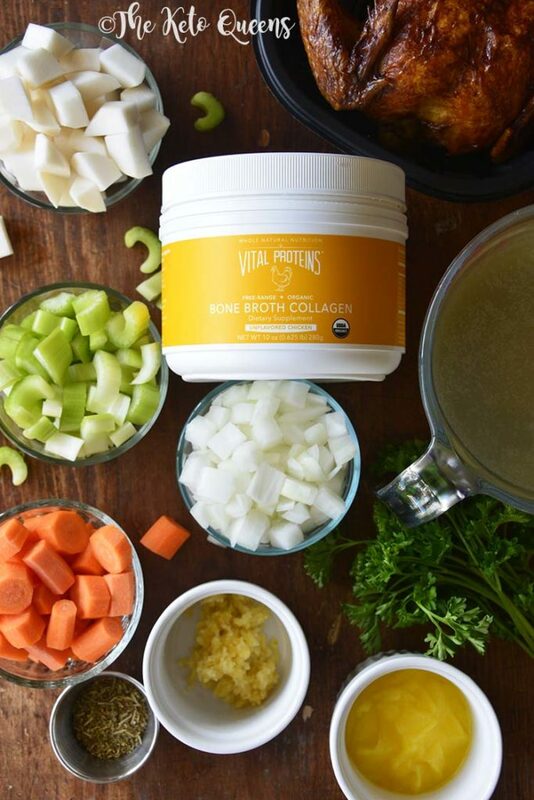 Disclosure: We’re super excited to announce that we partnered with Vital Proteins to make The Best Leftover Chicken Bone Broth Soup Recipe. Vital Proteins compensated us for our time; however, all opinions expressed are our own. 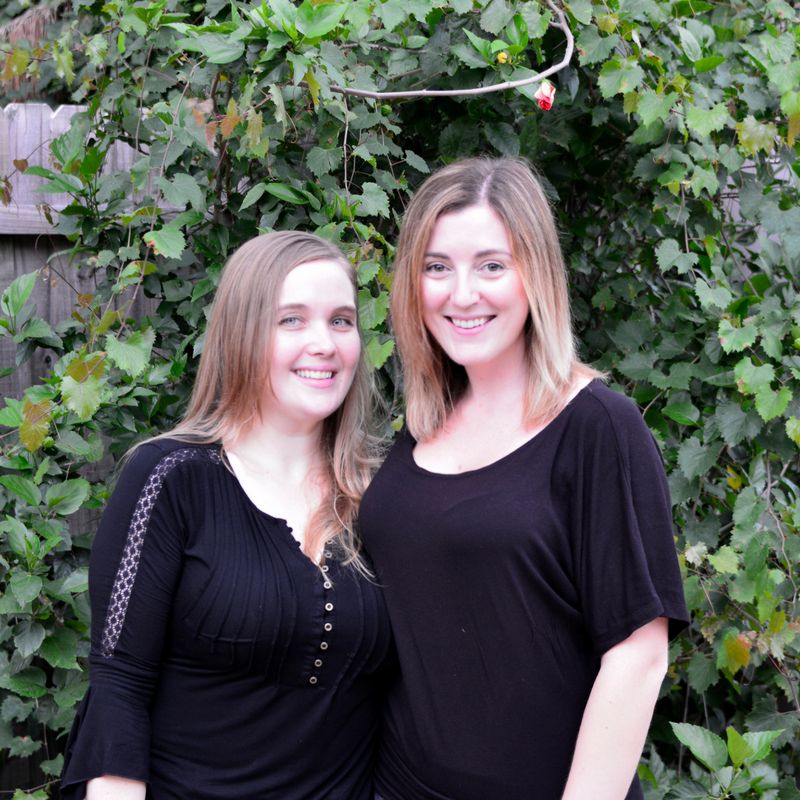 Thank you for supporting the brands that help make this blog possible! The Best Leftover Chicken Bone Broth Soup is every bit as hearty and comforting as a regular bowl of Chicken Noodle Soup. We guarantee you won’t miss the noodles! In this soup, we amp up the veggie content with carrot and celery, which are both pretty classic in chicken soup. We use organic grass-fed clarified butter for richness and healthy fat, and then use it to give onion and garlic a quick sauté. (Because let’s be honest, onion and garlic cooking in butter smells amazing and adds insane depth of flavor!) However, we then take things to the next level by adding turnip, which not only fools us into thinking we’re eating potato, but also adds delicious flavor. To keep this meal easy, we like to use a rotisserie chicken or leftover turkey (hello, favorite day-after-Thanksgiving dinner). 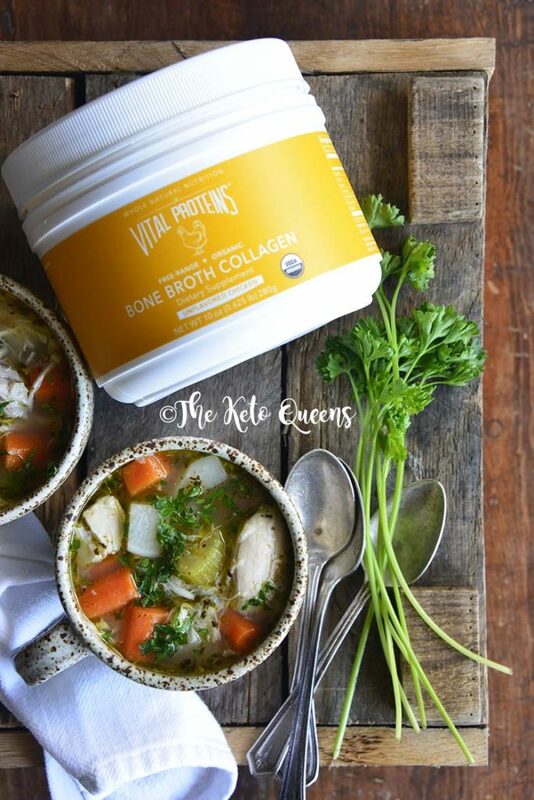 And to bump up the nutrition and add just a touch of body to the broth, we love using Vital Proteins Chicken Bone Broth Collagen. If you don’t have chicken stock or if you want to make your own bone broth it’s actually quite easy! My preferred way to make chicken bone broth is with a pressure cooker. You can make chicken bone broth in as little as a few hours with this method. With a slow cooker it would take you a few days to get the same consistency and nutritional value as you can with a pressure cooker. Whether you are using a 6 or 8 quart pressure cooker, fill the inner steel lining about 2/3 the way up with water. Then place 2 to 3 pounds of chicken bones, or 2 to 3 whole chicken carcasses into the water. Next add 1 to 2 tablespoons of apple cider vinegar, 1 tablespoon of salt, and any vegetable scraps you may have. You may also season with turmeric, black pepper, rosemary, or other seasonings of your choice. I like to cook mine for 2 to 3 hours on manual high pressure with a natural pressure release. If you are doing beef bones, I tend to add a 4 to 6 hour slow cook in addition to the 2 to 3 hours on manual high pressure. I add the extra slow cook time because the bones are larger and it tends to take more time to extract the gelatin and collagen from the bones. After the time has elapsed, remove the bones from the pressure cooker manually. Then drain all the broth through a cheese clothe to remove little particles of bone and vegetable scraps. Next, pour the chicken bone broth into mason jars. I’ll let them come to room temperature, and then store then in the fridge. When I’m ready to eat them, I will remove the chicken bone broth from the fridge and depending on how fatty the mixture was there may be a nice white fat cap on the top. Depending on your calorie goals, you may discard the fat cap or decide to reheat it (I opt to re-heat it because it tastes delicious!). I will re-heat them in the same mason jar, lid removed with a damp paper towel over the top. Microwave for 1.5 to 2 minutes on high. Stir and wait a few minutes to sip because it will be hot! 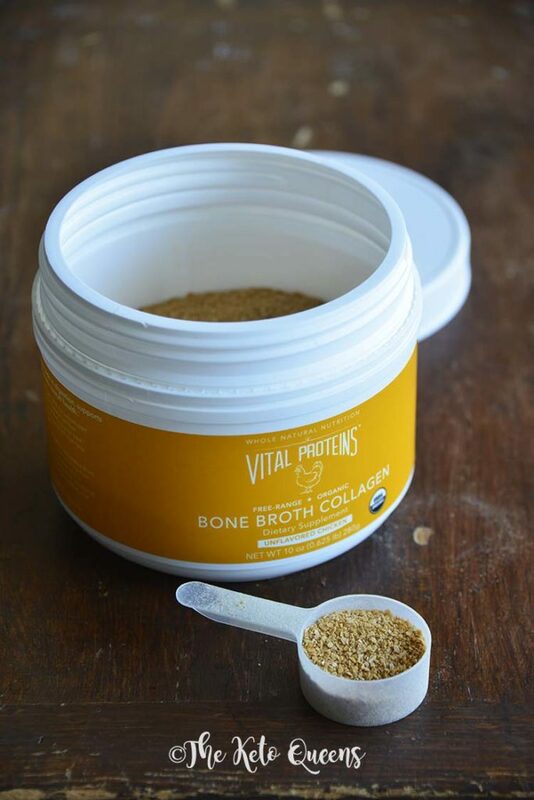 Alternatively, if you don’t have time to make your own chicken or beef bone broth, Vital Proteins has them conveniently in a powdered form so you can save time and still get the same health benefits. 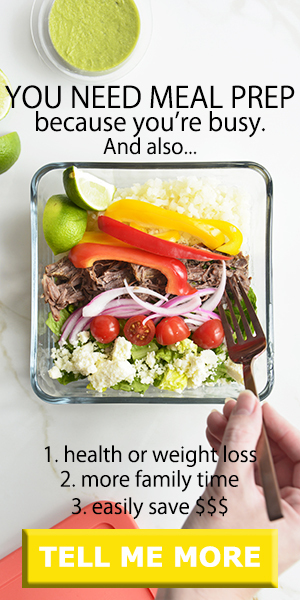 Fill your slow cooker 2/3 of the way full with water. Then place 2 to 3 pounds of chicken bones, or 2 to 3 whole chicken carcasses into the water. Next add 1 to 2 tablespoons of apple cider vinegar, 1 tablespoon of salt, and any vegetable scraps you may have. You may also season with turmeric, black pepper, rosemary or other seasoning of your choice. To get the same gelatinous consistency of pressure cooker bone broth, you will need to cook your chicken bone broth for 2 to 3 days on high in a slow cooker. What Can I Make with Leftover Shredded Chicken? Have you ever cooked a bunch of chicken and found out you cooked way too much? Well, it happens to me all the time. To get out of the boredom of eating plain shredded chicken, I’ve come up with a bunch of leftover chicken ideas over the years. How Long Does Leftover Chicken Last? I try to eat leftover chicken within 3 to 4 days of initially cooking it. I freeze anything that I can’t eat so that it doesn’t go to waste. Yes, you can freeze leftover chicken. If I have leftover chicken and I’m leaving and won’t be home in time to eat it before it goes bad, I’ll store the leftover chicken in a glass container and keep it in the freezer for a few weeks to a few months. 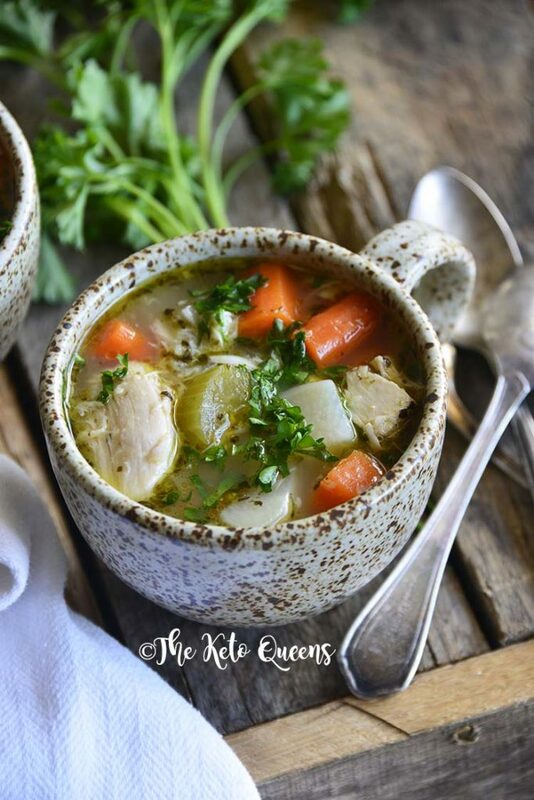 Ever wonder what to do with leftover chicken besides making our delicious soup (of course)?! 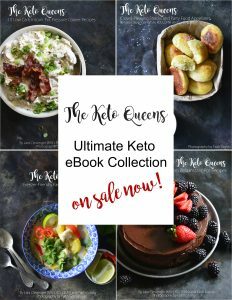 Have no fear, we’ve compiled a list of easy leftover chicken recipes so next time you have leftover rotisserie chicken you’ve got plenty of healthy leftover chicken recipes to choose from! 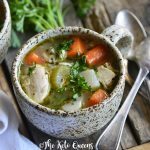 This Chicken Bone Broth Soup is every bit as hearty and comforting as a regular bowl of Chicken Noodle Soup! We guarantee you won’t miss the noodles. Heat the ghee in a 5-quart soup pot over medium-high heat. Add the onion and cook 1 minute, stirring constantly, and then add the garlic and cook 10 seconds, continuing to stir constantly. Stir in the carrot, celery, turnip, chicken stock, Vital Proteins Chicken Bone Broth Collagen, and dried Italian herb seasoning. Bring up to a boil, and then cover the pot, turn the heat down to simmer, and cook until the vegetables are softened, about 20 minutes. Stir in the chicken, cover the pot, and cook 5 minutes more. 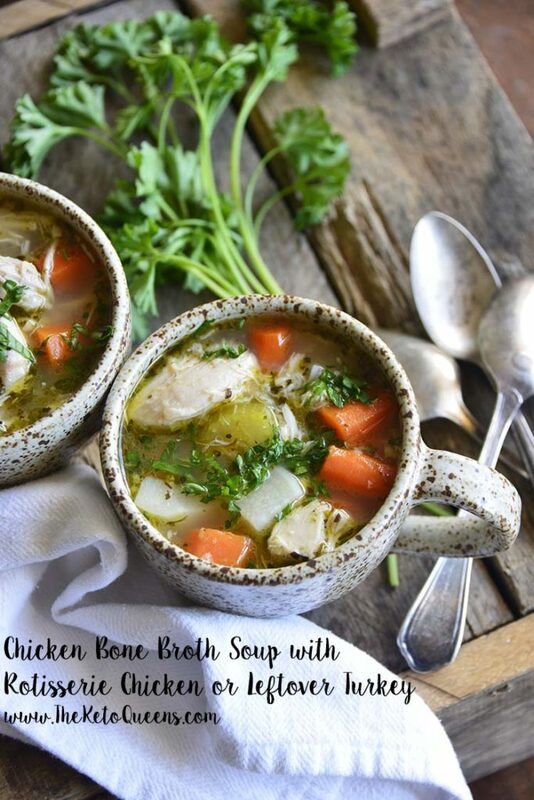 If you love this leftover chicken bone broth soup, then you may love these other bone broth recipes in our Anti-Inflammatory Bone Broth Ebook that’s on sale for only $2.99 on Amazon! Not ready to make the best bone broth soup with leftover chicken? Pin this image for later.